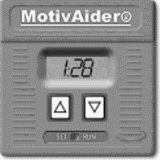 The MotivAider is a wonderful aid in remembering to check in with your feelings and your Guidance. You can program it to silently buzz against your body every 5 minutes, 10 minutes, 15, minutes, 30 minutes, etc. It is very easy to use and smaller than a cell phone. If you are having problems remembering to do your Inner Bonding work, this is for you!